Are “Grass Driveways” the new trend? Are we likely to see them pop up in neighborhoods across the country? A few days ago, I would have said we’re years off from that ‘green dream’, but now a commercial homebuilder in Ontario, Marshall Homes, has me rethinking that assumption. They are testing the viability of grass driveways (also known as green driveways) as part of a LEED case study. Apparently they are waiting to see how the grass driveway performs in the winter. They could have checked with us! We’ve been through all four seasons. The big thing people worry about is snow. Well, you can shovel a grass driveway. You can even use a snowblower on it, because the grass roots are protected by the plastic cells (in our case, Permaturf.) For us, there are many upsides and only one downside in a grass driveway. It’s an annoying secret you might not have thought about. When we built our drought-tolerant grass driveway in 2007 we were the 1st pilot project in North York. (You can read about how we secured a permit and built the green driveway in this series of step-by-step articles.) I thought what we were doing was so unique that only devoted environmentalists would go this route — but apparently not! I guess we’ll have to get comfortable with the fact that we’re trendsetters. We used PermaTURF plastic pavers which snap together easily to create an interlocking load-bearing surface that is drivable and can support large vehicles and trucks. Below are two photos from our installation. We built it in a long weekend. What is motivating builders to consider innovative environmental solutions? In the case of Toronto builders, one reason may be the Toronto Green Development Standards 2007 (GDS). The GDS performance targets include minimizing stormwater that leaves the site. 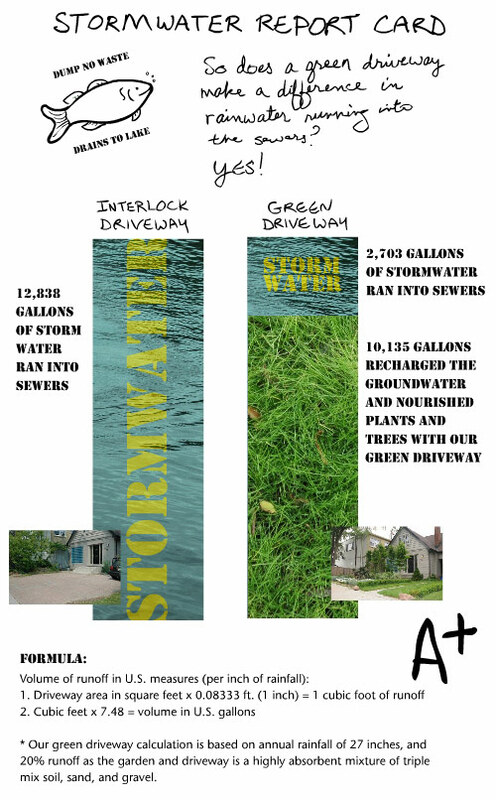 So, grass driveways (or permeable surfaces) clearly help satisfy the need for stormwater management solutions. Craig Marshall is right. 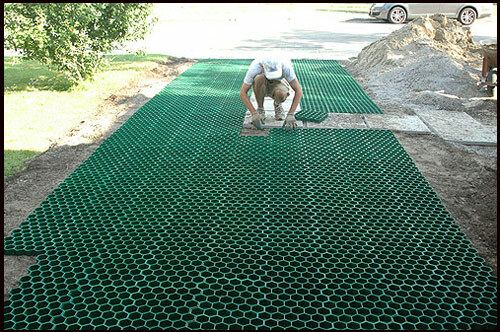 A big environmental advantage of a green driveway is permeability. In Paradise Unpaved, I compared the stormwater runoff from our former interlock driveway versus our new green driveway and garden. I found that about 75% of the total annual runoff was diverted from the sewers and now recharges the groundwater and nourishes plants and trees. But we are just one home. Would more permeable surfaces save the city really significant money? Chicago thinks permeable surfaces will save money. Their Green Alleys project aims to replace 1,900 miles of alleyways (more than any other city in the world), with permeable alleys. The program is designed to help manage stormwater, reduce the urban heat island effect and incorporate recycled materials (such as tires) into the permeable pavers. It’s an urgent initiative for the city. Their alleys are lacking proper sewer connections which cause serious flooding issues for homes nearby. The city realized that permeable alleyways would be a more cost-effective solution than expensive sewer hookups. What is the price tag to handle stormwater runoff? You may never have thought about stormwater management. The City of Toronto has been providing information about it for years, trying to educate businesses on how they can help. Here are tips from 2000 that include permeable pavers. But serious measures have not been taken, and the costs are mounting. A recent Toronto Star article ‘Lake cleanup viable if city handles runoff’ highlights the importance of Toronto finding a solution to polluted stormwater runoff. But putting aside number-crunching and environmental benefits, some people just want a grass driveway because it’s beautiful! I think Marshall Homes may be on to something, don’t you? Glad to see something new, Franke! And while I haven’t seen any green driveways near me, I’ll be on the lookout now. Thanks for that link on green driveways. It’s very comprehensive and I was pleased to see it included references to Chicago’s Green Alleys and LEED, too. P.S. I also blog at JamesGang.com and OfficePolitics.com. But MyGreenConscience.com blog is the best place to read my ruminations on the environment! This is excellent information on grass driveways, green alleys and how permeability can make a difference in our cities. You’re becoming a green authority on the topic! We’re in development for a green driveway. I’m bound and determined! Problem is we were told by our #1 choice for product http://www.invisiblesysytems.com (grassypavers2) that the grass would show wear with anything over low use. They recommended no more than 4-5 passes per day (2 round trips) or one day with lots of passes and several days off or wear would start to be seen. If that’s an issue we may go with honeycomed concrete pavers that would be filled with dwarf grasses in sunken levels. That way traffic would be less limited and we’d still have a grass driveway (the car would be parked on an isolated paver stone pad.) BTW- We live in southern CA. My question to you: How often do you drive over the grass and how long do you park on it per day? Thanks so much for making your blog, it was a great thing to see! And thanks for your help in advance. Thanks for writing to me about your grass driveway. Ironically when I was out for a walk the other day I saw an official Parks and Recreation vehicle (a small truck) drive over grass to exit the park. This area was just grass, with no support pavers like PermaTurf under it. My guess is that the city workers were too lazy to raise the barrier bar (which prevents ordinary vehicles from driving in the park) so they took a detour and drove right over the grass. I was curious, considering our grass driveway, to see what damage they’d done. When I inspected, the grass was flattened but looked fine. On a wet day, I think the damage would have been deep tire ruts — which is why the new technology pavers (such as Permaturf.com or invisiblesysytems.com) are so important. If you care about your grass looking beautiful, then you’ll want to park your car in a garage (or in your case on the stone paver pad) — or strategically move your car to different parts of the driveway so as not to kill the grass from lack of sunlight. There is a grass driveway a few miles from us. It is made of concrete pavers (the type you refer to as an option) that allow the grass to grow up between them. I could be biased, but it does not look as good as ours. It’s actually a great example of what happens when owners don’t maintain a grass driveway. I was curious about this grass & concrete paver driveway so one day I knocked on the owner’s door. She was very funny to talk to. She hated the grass driveway and does not maintain it well. It was installed by the previous owner, an architect (perhaps 10 years ago?). She complained of women getting their high heels caught in the grass, and of the grass dying due to the car sitting on top of it. She lets a neighbor park on her grass driveway, and the car sits in the same spot all the time. The grass is dead where the car parks. In this woman’s case, the grass driveway is a secondary driveway. She also has an interlock one — which is probably why she hasn’t bothered to do anything about replacing her grass driveway. Her complaints are legitimate — however the environmental benefits of reducing stormwater runoff, eliminating the heat island effect, recharging the groundwater, feeding trees and plants etc… far outweigh these problems. We are thrilled with our drought-tolerant grass driveway. The only minor downside is weeds (see below). Yup. Just like any lawn it needs to be weeded. In one article I pointed out that grass driveways get weeds. They are just like any lawn — but because of the honeycomb cell structure they are harder to weed. A sharp pointed tool to remove weeds is essential given the small size of each cell. In many areas of North America, (and in some areas of California) restricting water usage is important. I recommend that you find a drought-tolerant grass and grow it from seed. We used Eco-Lawn and are happy with it. The builder I wrote about in my recent post is using sod. That is a quick solution and understandable for a builder of subdivisions — but the drawback to sod is that the grass does not put down deep roots and therefore requires more frequent watering. Our Eco-Lawn has roots as long as 13 or 14 inches. A huge difference in its ability to source water. My response to the reporter confirmed that the fellow was partly correct. The fluids from parked cars will damage the grass — but ironically that’s exactly why you want a permeable surface. If he had an asphalt or concrete driveway the fluids from his car (oil, A/C, etc.) would be invisibly carried into the sewers by stormwater. http://www.Riversides.org reports that stormwater is the leading cause of water pollution in urban areas. With his grass strip the fluids ‘only’ damage his grass, not pollute the nearby lake — in this case, Lake Ontario. I think invisiblesysytems.com is giving you reasonable advice about not driving over your grass driveway too frequently — they don’t want to raise your expectations and then have you call back and complain. However the grass roots are protected by the cells. If you’ve installed it properly the grass should not get damaged — but the blades will flatten out and take awhile to bounce back up. We don’t have a car (see my essay: My SUV and Me Say Goodbye), so any traffic we get on our driveway is minimal. That’s why I’ve cited other driveways as more practical examples. I hope this information is helpful to you! If you do build a green driveway, please send me a photo. I’d love to feature other people’s grass or green driveways too. The company I was researching explained to me that with their set-up there is no difference between sod and seed as far as finished installation goes. They introduce a mixture of materials over the gravel base they call ‘hydrogrow’. And interestingly have zero soil in the install when using a very short cut sod (6-8” gravel/sand mix base, 1” sharp sand in cells, short cut (1/2”) sod grown in sand or sandy loam.) They say that with this mix and a 3-4 week rest after install the roots will grow just as long and established as with seed. They also claim that with their set up less irrigation is needed than with any other green paving set-up because with the design of their cells they have the largest amount of open space at the base for roots to grow and the addition of the ‘hydrogrow’ increases that viability. As you can see from their website invisible systems has done many many installations (some enormous ones) and their research is very thorough so they seem trustworthy. Anyway, I thought you might find that interesting. Thanks again and we will definitely send photos of construction! Thanks for the info. I was wondering how hard it is to walk on, would it hurt my dog’s paws? 2. Weeding. The separate cells make weed removal a bit trickier. You need to dig them out cell by cell. We are considering purchasing a house with a double asphalt driveway in a state of disrepair. Are there paving companies that would take it for crushing and remixing? I don’t want it to go to landfill. That would be worse than it staying on the driveway IMO. I suggest you post this question on http://www.freecycle.org — that’s where we ‘freecycled’ our 800 square feet of interlock (and lots of other things). You may find your answer there. This is fantastic. I have recently retired, my husband is on disability and we are down to one driver and one vehicle. We don’t drive much except to visit grandchildren and shopping. The gravel driveway has been slowly turning into a grass driveway. I have been wondering what to do with it? This sounds perfect. I think it’s ironic that the world is calling a trend of what the world has always had. Only now companies are sticking some plastic under it! My home has had a ‘grass’ driveway since it was built in the fifties. The driveway earth is very hard packed, high heels can go on it, and a grass grows on it. A path is made where our tires most commonly drive and either we start driving on a slightly different path to the left or the right or we don’t change and a very short almost mossy type grass grows where our tires tracks are. We never mow the driveway. The tires and the crappy, hard packed soil prevents it from growing long. We snowblow in the winter and shovel as well. We’re a bit more north than most so we generally pack the snow down first with the vehicle tires and then snowblow on top of that. In the spring summer and fall the driveway looks great – just like in the old country mansions with the long windy driveways that you see in the movies. We will be filling in some dips that have developed over the years, but we’ll just let the grass grow back again. Thanks for your comment. Our City will not allow grass to be used as a driveway. It is against the bylaws and we would be fined. The City is concerned about tires leaving ruts in the grass and mud ending up on the sidewalk. For that reason we had to get a special permit to build our “green driveway” using the PermaTurf pavers. They create a load-bearing surface which can support vehicles as heavy as fire engines. How long does this type of driveway last compared to other paved or interlocking brick? What kind of maintenance is required, beyond weeding and cutting? Would this type of driveway have any impact on our house foundation? Will we be more or less likely to have to deal with moisture seeping into the basement? Do you have to dig up the existing paved driveway first or can it be installed on top of an existing driveway? Question: Do you have to dig up the existing paved driveway first or can it be installed on top of an existing driveway? Yes. Read the Green Driveway Articles. Here are my step-by-step series of articles on how to build a green driveway yourself. Question: Would this type of driveway have any impact on our house foundation? Question: Will we be more or less likely to have to deal with moisture seeping into the basement? You’d have to speak to an engineer or a waterproofing company. We had lots of flooding issues BEFORE we built our green driveway. So, we had our house waterproofed. Very expensive but necessary. Since building our green driveway we have had no problem with flooding — but the two are not necessarily related. Question: How long does this type of driveway last compared to other paved or interlocking brick? What kind of maintenance is required, beyond weeding and cutting? Maintenance is just watering, cutting and weeding. The pavers are recycled plastic and will last a long, long time. As far as comparing it to a paved driveway, you’ll have to contact companies such as PermaTurf that make the pavers (there are lots around so do your homework). We did this project as a DIY. I don’t sell or build green driveways! Good luck. Send me a picture if you build a green driveway! Very cool. I live on Cape Cod and have wanted to tear up my asphalt driveway and install grass with pavers or concrete runners. I love this permaturf solution. I’ve debated back and forth on ripping out the driveway and this article convinced me. Hi, I live in the Midwest and stumbled onto your article. It looks nice in the photos. This past year I elected to repave my driveway as a ribbon drive using regular red bricks with grass between the ribbons (it is doing great!). I have seen many grasspave type systems like your driveway and the grass struggles with any regular use. The topsoil the grass is growing in is very shallow because of the rock base below and it seems that drought periods will totally kill large areas of the turf. And the turf seems to die where the car is parked (regularly) when winter salt is dripping off the car, essentially killing the soil. 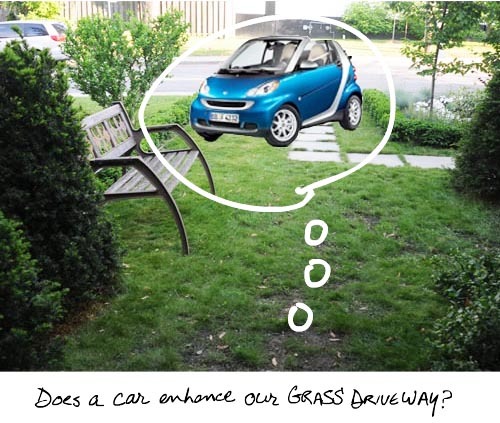 Now that your driveway is a few years old, how has the grass stood up to the shade and wear from the cars? Do you park on it every day? Thanks for your question. We don’t have a car, (see My SUV and Me Say Goodbye) so cars rarely park on our green driveway. However we have found that the drought tolerant grass was not as good as we’d hoped… the deep roots can’t get enough moisture from the sand/gravel/soil base that is needed for the green driveway… Now, I’d recommend clover or a shallow root grass. As a landscape architect I have designed many projects using a grasspave system like the one you used. I have never been happy with the results unless we heavily irrigate the paved grass area (which defeats the intent). The turf will completely die off in most areas during drought and in areas where winter salt drips off the car regularly. Even areas with no traffic (designed for fire truck access) have performed poorly. They always look so nice in the brochures. I think it is important that your readers understand that they should keep their expectations low. These are a great idea, but they rarely look superb. We have moved away from this technique and started using permeable concrete poured-in-place paving with water storage gravel below. That is a system that works as designed and looks as someone would expect, but is not something a do-it-yourselfer could install, though. That is why I went with a ribbon drive for myself. That way most of the rainwater will wash into the lawn, not into the storm sewer. I must say the biggest challenge has been to keep the grass looking nice next to the ribbons after visitors come over. Most drivers are not good at staying on the ribbons, though my wife and I never miss. I could see using the grasspave product (without the gravel base below) in the center and on the edges of the ribbons to prevent turf damage by these visitors. I’ve been toying with green driveway options, as my current asphalt is crumbling. The two (three) biggest issues I have are maturing trees and slope…. the current driveway is level for the first half (about 100 feet) but edged by five randomly located, 80-foot oak trees. Of course, their roots are heaving the paving, and of course, I’d rather not lose them (two have died in the 10 years we’ve been in the house) if i don’t have to–which is why I’d like to have a green (or greener) drive. The second half of the driveway curves and slopes about 5 degrees, and I’m concerned that the grid sections may not be sufficient to “hold the slope.” Length is a sort of half-issue: 200+ feet is a lot to dig out! Would love to see an update article now that several years have passed about your maintenance and expectations for the future. I have to say, Franke James, your Eco-friendly Driveway is a really fantastic. one of the problems with this is cities like san Antonio where I live. I had a partial driveway of dirt that was so packed over a period of years that It was just about as hard a the street. code compliance came out about 10 yrs ago and made me dig it up and put something acceptable in, I used some ground asphalt and gravel , it is the biggest eyesore and problem you could ask for. weeds and grass everywhere and holes where the cars park. some cities do not allow the freedom of a better way because of the letter of the law. Great article. We represent the Drivable Grass products in Canada and are receiving a wide range of inquiries from people who are seeking this green (and multi-purpose) alternative for their driveways, RV parking, off street parking, and other projects at their homes and businesses. I welcome you to check out the products at http://www.soilretention.com and then contact us at 1-855-975-6737 – we’d be pleased to provide you with a quotation for your project.